We hung the bicycles back on the garage ceiling (except for Miss Eight’s–as long as it isn’t snowing, she’s riding her bike), mowed the lawn for maybe the last time, stowed the patio furniture in the shed, and put soup on the menu three times in one week. In many countries, a soup course is an everyday part of dinner, but here in middle America, it’s a little weird. Not that fear of a little weirdness ever got in the way of dinner at our house, but I am cold and the mere thought of soup warms me up. Soup is ideal for making ahead and reheating later, and can be incredibly frugal. That bread and garlic soup on this week’s menu? Didn’t have to buy a thing. The ingredients are bread, garlic, olive oil, paprika and chicken stock. I made chicken stock (in the crock pot) from a frozen chicken carcass. There are always bags of slightly stale good bread in our freezer, and garlic and olive oil in the pantry. Making something delicious out of scraps always gives me a little thrill. That’s probably weird, too. Spaghetti and Meatballs (from the freezer), Wilted Escarole Salad. This might be the first time I’ve bought escarole. It’s perfect for a hot dressing because the sturdy leaves don’t wilt too quickly. Lentil Salad, Roasted Eggplant and Olive Spread, pita, green salad (swap with Jen). I also dug a small container of falafel out of the freezer. I didn’t follow the recipe above, but just made Baba Ganouj from the Moosewood Cookbook. Stromboli, kale salad. A giant pizza roll, according to Mr. Ten. I used this pizza dough with a little bit of whole wheat flour. It worked great, but would have been easier to work with if I’d chilled the dough before rolling up the stromboli. I baked it at 400 degrees for about 20 minutes. A fun twist on pizza night! This weekend was so brimming with activities that I am actually looking forward to this week for some quiet time. I don’t even mind the chilly weather, so long as the rain holds off until I can mow the grass in the morning. In between birthday parties and band fundraising and church, the Hub baked scones and banana bread, and Little Five sacrificed the small pumpkin he brought home from Friday’s field trip so that I could make a pie. I’m not feeling very ambitious in my meal planning for the rest of the week, so we’re going to use what we have and I intend to CLEAN OUT THE FRIDGE. You heard it here first. The highlight of our weekend was a drive into the city for an exhibition of works by one of our elementary school art teachers. The weather was crisp and sunny, lunch was delicious, and the art was beautiful. The kids loved talking to their teacher and telling her which piece was their favorite. They also fully appreciated the snack table. We should plan outings like that more often. I’m off to the library and Goodwill. Fried green tomato BLTs with fennel mayonnaise, fruit salad. These were as good as the Hub thought they would be. The boys even ate them! Chili, cornbread, salad (swap with Jen). The cornbread recipe on the Quaker cornmeal box is pretty good, especially if you add some corn kernels to the batter. Split pea soup, croutons, salad. This is a delicious slow cooker version of split pea soup, and the croutons are a great way to use up all those bits of slightly stale bread cluttering the freezer. They scent the house with cinnamon-y goodness. Thirty minutes, start to finish. The apple butter is on the INSIDE! The recipe is flexible: use whatever combination of flour you have (or 2 cups of Multigrain Flour Mix). And if you’re running out of milk, making up the difference with juice or water is perfectly acceptable. 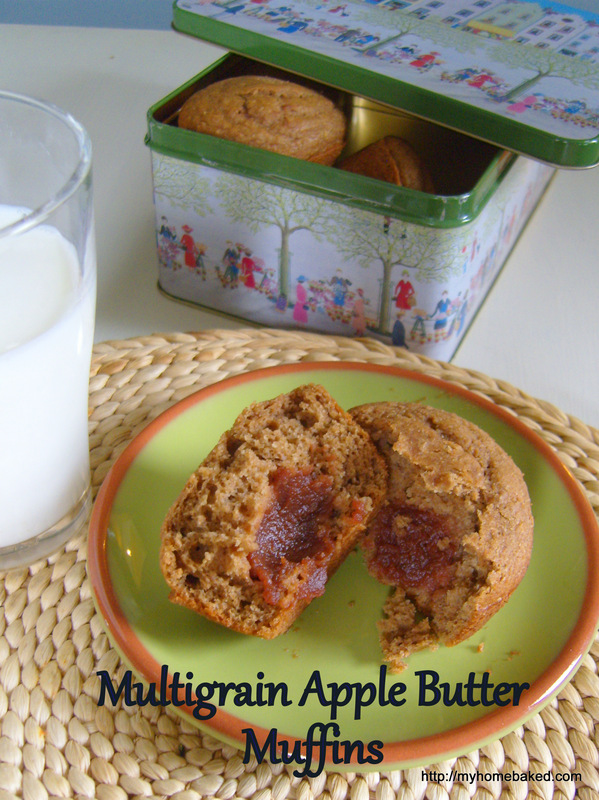 It’s like Stone Soup, but in muffin form. Heat oven to 500 degrees F. Grease 12 muffin cups. In a large bowl, whisk together flours, wheat bran, brown sugar, salt, baking powder and cinnamon. In a 2-cup measuring cup or small bowl, whisk together milk, oil and eggs. Whisk the liquid ingredients into the dry, blending for no more than 20 seconds. Fill each muffin cup half full of batter. Add a heaping teaspoon of apple butter to each cup, and then just enough batter to cover the apple butter, distributing any extra batter evenly among the cups. Turn the oven temperature down to 375 degrees and bake for 20 minutes. Cool muffins on a rack. Best served slightly warm. Ah, Columbus Day. The kids are home from school, and Mr. Ten is playing with the junior high marching band in Chicago’s Columbus Day Parade. We’re excited to watch them on television this afternoon. In the meantime, I have big plans to buy foam for a headboard DIY (taking advantage of those Columbus Day sales), if we can all get dressed and turn off Hannah Montana for a minute. Miss Eight would like to invite a friend over or go to the pet store to buy a hamster. Little Five would like to remain in his pajamas and play Super Mario Bros. all day. My magic eight ball says that someone is going to be disappointed. Fried green tomato BLTs with fennel mayonnaise, fruit salad. We’re making this up as we go. Easy Sliders. Mr. Ten saw me getting out the pretzel rolls, gave me hug, and said, “Thank you for making these!” I only assembled 12 sliders, which was plenty for dinner and lunch the next day (for a lunchbox, cut the sliders in half and heat them wrapped in foil, then stuff the hot foil packet into a warmed thermos jar). The rest of the meat mixture went into the stuffed peppers. Seco de chancho (Ecuadorian pork stew), yellow rice. This sauce is great no matter what meat you use, and the leftovers are good in tacos or stirred into scrambled eggs. Slow Cooker Stuffed Peppers. I used leftover meat from the sliders, rice and a can of tomato sauce for the filling. I didn’t plan ahead, so I baked them at 350 with a little water in the bottom of the baking dish. The kids ate them! Sesame noodles, stir-fried garlic green beans. Garlic and Thyme Roasted Chicken with Mustard Croutons. Deeeeelicious. There’s your Sunday dinner plan, right there. Just today, this little blog made it to 200 followers! Thank you for reading–your support means a lot. We’ll have to celebrate! After a good long stretch of Indian summer, fall is finally really here. We’re getting out the sweaters, taking the wool coats to the cleaners, and thinking about Thanksgiving. I’m looking forward to more soups for dinner and cups of tea in the afternoon. (I can’t be the only one falling asleep at 2 p.m. Or noon.) I even bought three little pie pumpkins so the kids can enter the “decorate a pumpkin like your favorite character from a book” contest at school. Miss Eight has already decorated hers to look like Fancy Nancy, but I’m kind of hoping the boys will just let me roast their pumpkins and make pie. Slow Cooker Stuffed Peppers. 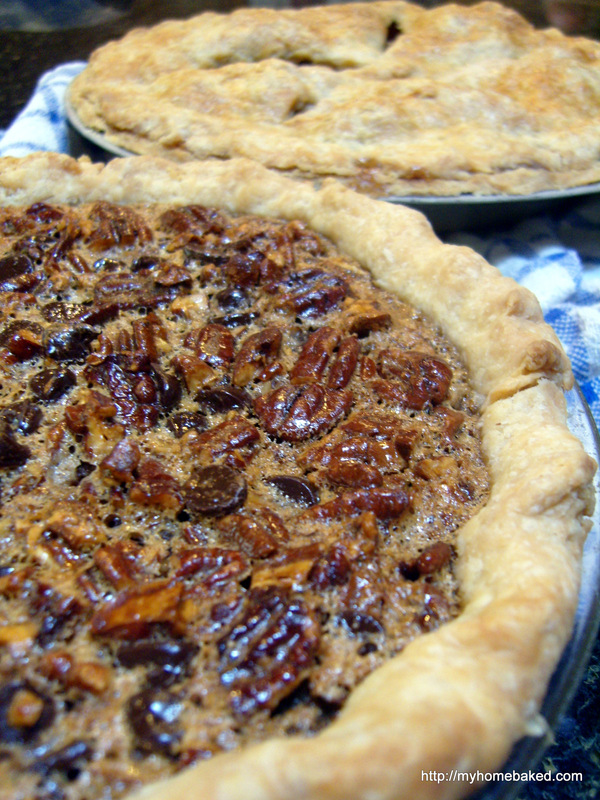 I really don’t know whether any of the kids will eat these, but I think they’ll like the filling. I might make some apple crumble to motivate them to try the peppers! Mexican Pizza, salad. Very good! Next time I’ll dial down the chile powder just a bit, and maybe have some more toppings on hand–guacamole! Salmon with herbs, potatoes and Brussels sprouts. Finally! Everybody ate salmon! Don’t leave out the sauce on the side–garlic mayonnaise, or a lemony-herb yogurt sauce. Winter squash soup with croutons. The kids still aren’t squash lovers, but they’ll tolerate this soup because of its savory spices. Roast the squash and add a little more cream than called for to make it more soupy than baby food. I’m fairly confident there are half a dozen projects I ought to be working on, but the only thing I’ve really accomplished is cleaning and adjusting our sometimes fickle espresso machine. I never would have bought it for myself, but when we received it as a housewarming gift from my parents almost six years ago, we soon found we couldn’t live without it. Why would I darken the door of Starbucks when I can froth milk and dispense espresso like a barrista while still in my pajamas? It does require some maintenance, though, and I am very pleased with myself for tuning it up with nothing but the vacuum cleaner and a hex wrench. 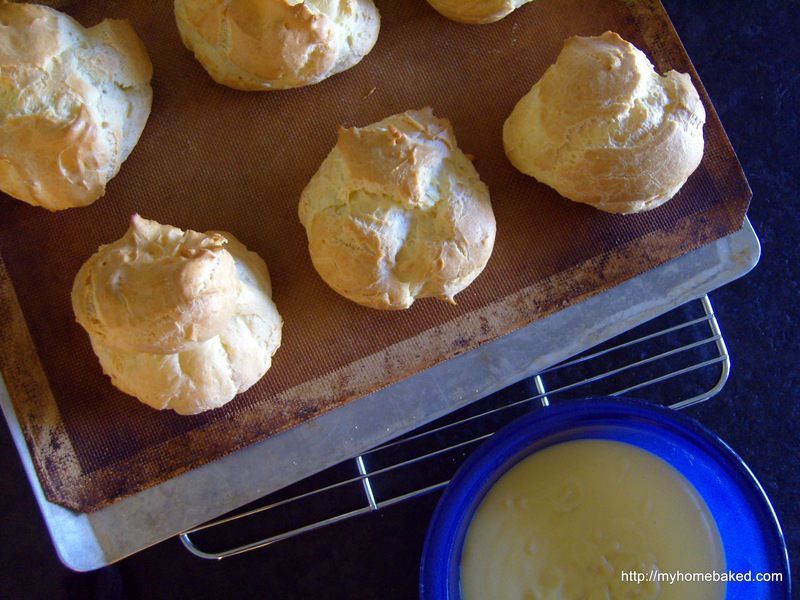 We’re going to need a good cup of coffee to go along with those cream puffs. Fish cakes. Success! And now there’s a bit more space in the freezer. Chicken with Bacon-y Brussels Sprouts, thin egg noodles. One skillet, so good. In the past, I’ve used chicken broth as the liquid, but this time I used a little white wine, which really brought out the sweetness of the Brussels sprouts. The kids may have accidentally eaten a few bites while they were mining for bacon bits among the noodles. Tabbouleh and grilled cevapi (swap with Jen). I love this tabbouleh recipe, and fill it with whatever veggies are in the fridge. If you’re out of lemons, red or white wine vinegar works fine. Spaghetti with meat sauce (from Jen); garlic bread. Tasty comfort food. Toasting the unpeeled cloves of garlic for a few minutes in a dry skillet removes the bite–but not the flavor–from the garlic bread. Pork and Green Chile Stew. Serve it over rice or with warm corn tortillas. We should cook with chiles more often! 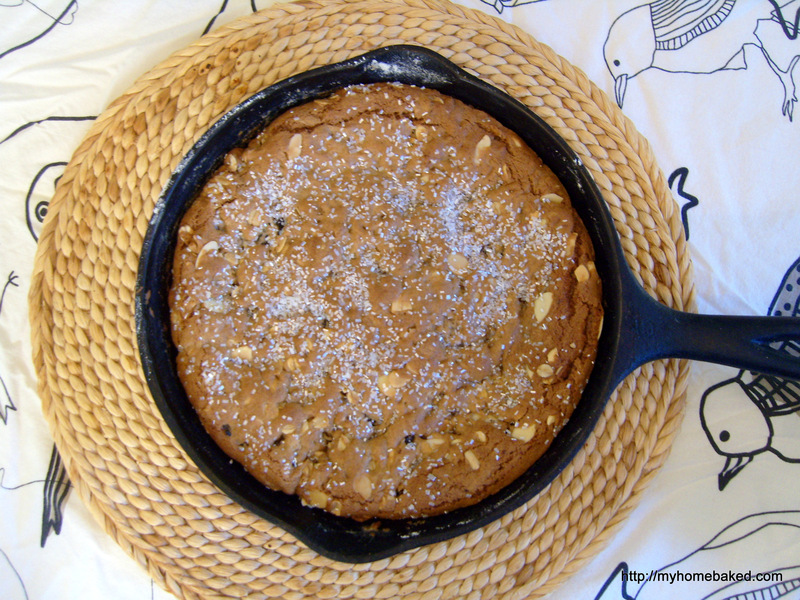 Breakfast Oatmeal Skillet Cookie. 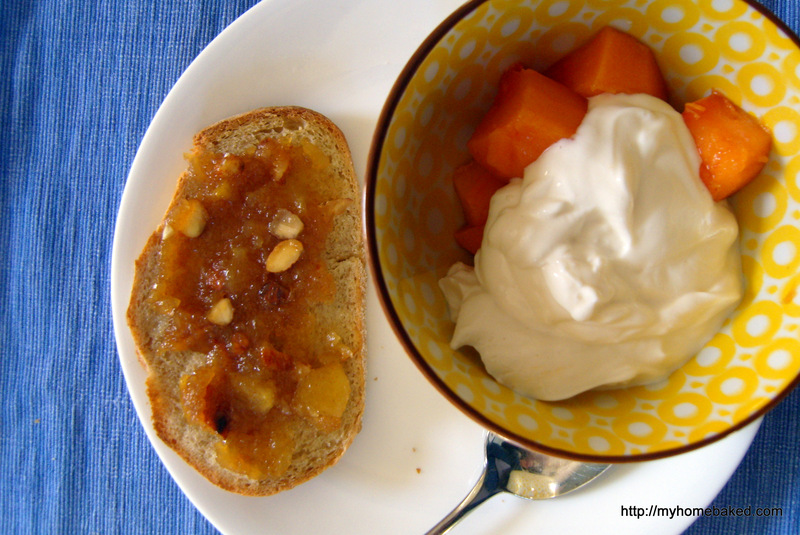 Miss Eight helped make this for Saturday breakfast (swapping almonds for the walnuts and vanilla for the maple extract)–a big hit with the whole family. Next time I intend to experiment with reducing the butter and sugar a little. Aside from that one bad experience with a Dover sole (it was probably just a virus), if given a choice, I will still choose the seafood. My boys like fish, too, and Miss Eight eats it sometimes, which is better than nothing. They also like most anything made into a little fritter, even if they won’t eat it otherwise (i.e., zucchini). I love the transformative power of the fritter to turn scraps (or good food that some people think they don’t like) into a perfectly lovely meal. I was digging through the freezer, attempting to use up some bits of this and that, and decided to try making some fish cakes with two small tilapia fillets and about half a pound of smoked mackerel (left over from brunch a few months ago). I quickly pan-fried the tilapia, and then flaked it into the mixing bowl with the mackerel. 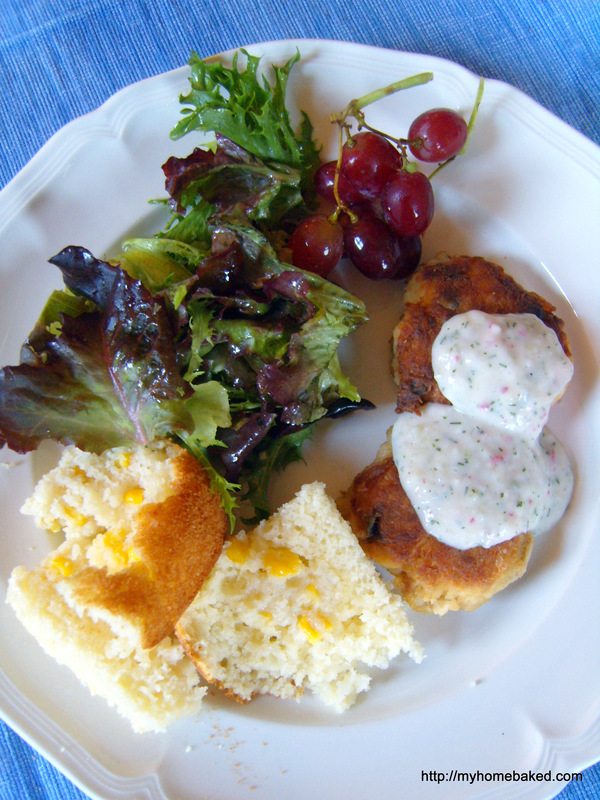 I wasn’t sure how the smoked fish would fly with my taste testers, but I got one “Really good!”, one “Cleaned my plate!”, one “Tastes better than it smells,” and one “How many bites do I have to eat?” I thought these little fish cakes were delicious. I like smoked fish on a bagel, so it really isn’t such a surprise. Granted, the frying fish smell was a little strong, but nothing that some open windows and a pine-scented candle couldn’t erase. You can use whatever fish you have, really–canned, grilled, smoked. Because I had a high proportion of smoked fish, I didn’t add much seasoning, but if you have a mild fish you will want to add salt, pepper, a dash of Worcestershire or soy sauce, and maybe some scallions or chives. In place of bread or cracker crumbs, you could use some mashed potato. Experiment! 1 pound of cooked fish, skin and bones removed. Stir together the egg and mayonnaise, and then fold in the remaining ingredients, breaking the fish into small chunks or flakes. Chill the mixture for at least 15 minutes. Pour just enough oil into a large nonstick skillet to coat the bottom (about 3 Tbsp.) and turn the heat to medium-high. Scoop the fish mixture (about golf-ball size), press into small patties and dredge in flour. Fry until golden brown, about 3 minutes per side. Drain on a paper towel lined plate. 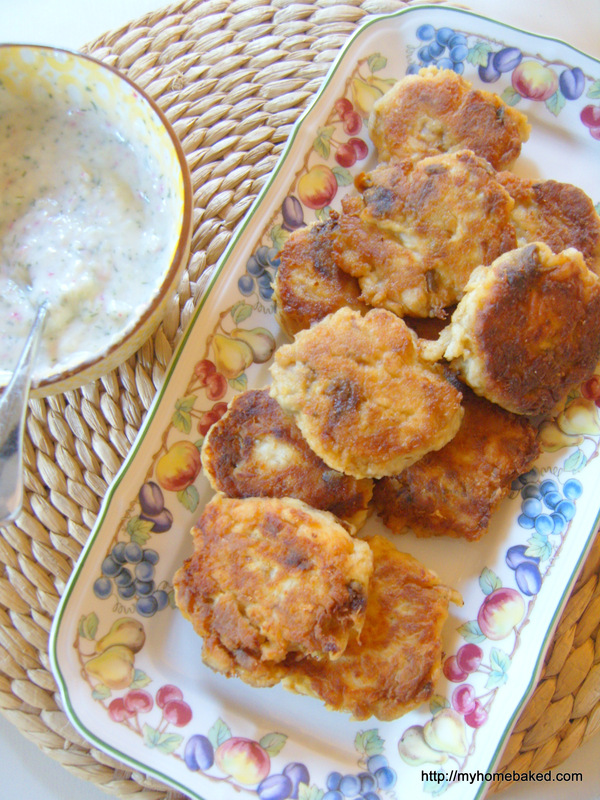 Serve with remoulade sauce, tartar sauce, or any kind of sour cream or yogurty-dill sauce. To continue my thrifty theme, I puréed a little bit of this leftover salad and whisked in some mayonnaise. My Facebook feed was filled with photos of friends picking apples this weekend. As the lucky recipient of an entire trunk full of apples, I skipped the apple picking and moved straight on to the peeling, coring and applesauce making. Though I peeled and chopped nearly 20 cups of apples, I barely made a dent in the apple supply in my basement. I made one small batch of Apple Almond Honey Conserve from Food in Jars, which tastes like fall when spread on homemade bread (see my breakfast, above). 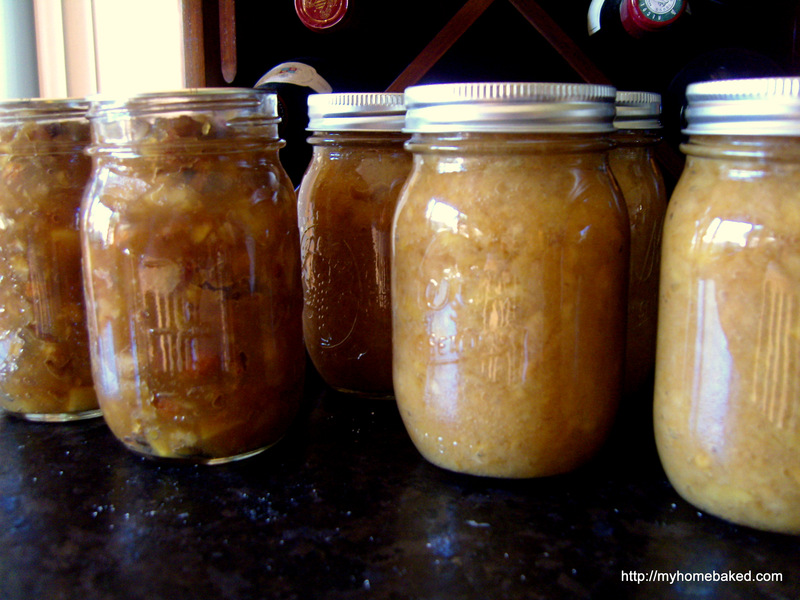 I also made one batch of chunky applesauce in the slow cooker. My goal is to process a bag of apples every couple days, so that maybe I’ll be finished sometime next week. I’m going to need more jars. Fish cakes. I’m flying without a recipe here, but I have a couple tilapia filets and some smoked mackerel. Cheese and Chicken Quesadilla Pie. Big hit with the kids, and definitely a 30-minute meal (most of it is baking time). Lentil Soup with Coconut Milk and Warm Spices, rice. I’ll be using brown lentils, and following the suggestions to streamline the recipe. My new favorite lentil soup–don’t forget the squeeze of lime. So glad there was enough to freeze for another meal! Yogurt-Marinated Shrimp, pita, some kind of fruit salad. Mmm…shrimp. The marinade (Iemon-garlic), plus leaving the shells on, kept the shrimp from drying out under the broiler. Black Bean Burgers, roasted potatoes, salad. In a reverse-vegan move, I replaced the flax seed with an egg. My only complaint is that these turned out a little crumbly–maybe I will make thicker patties next time. Tortellini Soup. This is strictly for lunchbox thermoses. Quick enough to cook during breakfast and ladle into thermoses. Two out of three kids ate it up, and I had some for lunch, too. Homemade broth is the key, even if you have dried tortellini (I like the Trader Joe’s brand). Maple-Bourbon Banana Pudding Cake. The Hub made this Saturday night, and it was superb. It only takes one overripe banana, and the rest you probably have in your pantry. Regular granulated sugar and 2% milk work just fine. I grew up eating this salad on a regular basis, but over the years, it evolved into something else. First, you have to understand that we ate this as dessert, not as a salad. We skipped the celery. For a long time, a few maraschino cherries (and a splash of juice from the jar) dressed it up. Eventually, sour cream or yogurt replaced the mayonnaise. Raisins got traded for diced prunes (too mushy, in my opinion) or dried cranberries. The maraschino cherries became passé, replaced by a little lime zest. 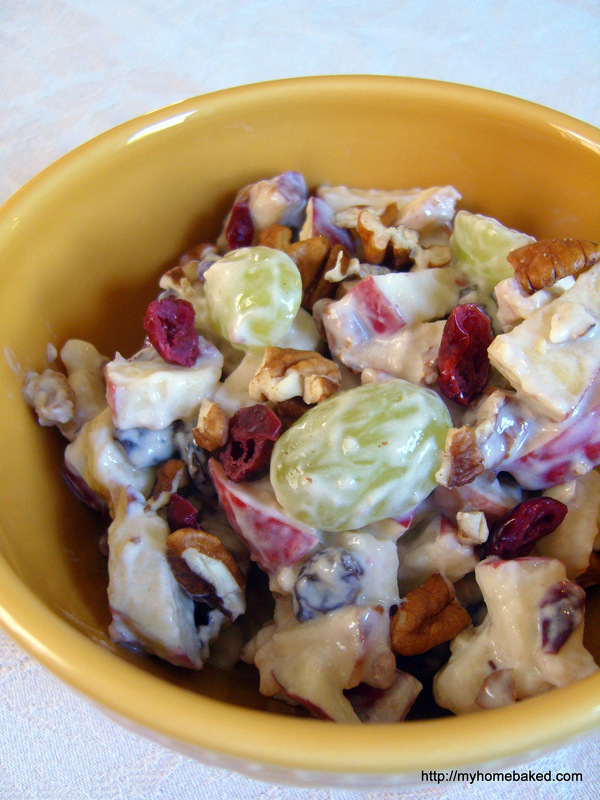 I haven’t managed to convince my children that apple salad = dessert (perhaps I should bring back the cherry on top), but it still makes an appearance on our table, especially in the fall. I’ve been known to eat the leftovers for breakfast. Whatever you call it, it’s good. Toss all the ingredients together in a bowl. Serve. It’s been pleasantly gloomy in the house all day, an intermittent drizzle falling gently outside. Squirrels are everywhere, always with a fat acorn crammed into their mouths. I’ve been puttering around, doing Sunday things like reorganizing my sweaters, scrubbing burnt sugar off the bottom of my stockpots (one down, one to go), more laundry, more dishes. The kids have been gorging themselves on old iCarly episodes and running out to play in the rain. I started looking around for banana cake recipes, but I think I’ll just bake muffins instead. Lentil Soup with Coconut Milk and Warm Spices, rice. I’ll be using brown lentils, and following the suggestions to streamline the recipe. Tortellini Soup. This is strictly for lunchbox thermoses. Sausage, Potato and Apple Bake. I have to scale this recipe up a little, and I used fresh brats instead of Italian sausage. Always good. Chicken Milanese, cherry tomato and arugula salad. Four fat chicken breasts, pounded flat, made enough chicken cutlets for two families. Cherry Tomato Cobbler, roasted beets with vinaigrette, (mac-n-cheese from the freezer for the tomato haters). Incredible, from the jammy tomato and basil filling to the tender cobbler topping. No, the kids didn’t eat it, but then there was more for breakfast for the adults. I used a scrap of hard sheep’s milk cheese instead of ricotta salata–I’m certain you can substitute any flavorful cheese you like. Try this for brunch, maybe with a runny egg on top.